Things have been somewhat silent on the Happy Wine Woman front of late. Why? Because I’ve immersed myself in the world of spirits in the hope of taking the Unit 4 WSET Diploma exam only once. There is nothing quite like having to blind taste and write about spirits in an exam situation to strike the fear of god into this devoted wine drinker! One category I had been struggling with was rum. I don’t really drink rum, nor do I drink cocktails with rum in them. There are so many different ways to produce rum and with such relaxed regulations around rum production I’ve never really got my head around it. 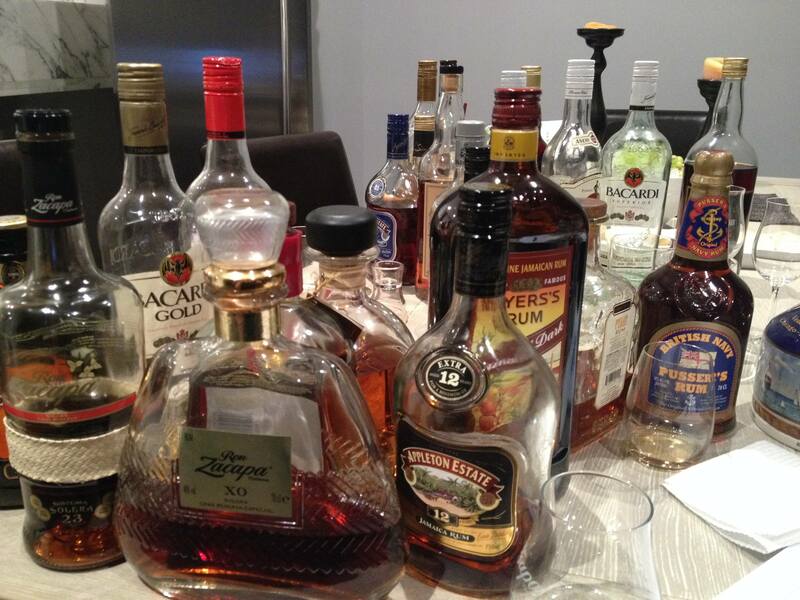 Over three hours we tasted through 18 different rums, all different quality and styles. As expected there is certainly a theme to the descriptors below – mostly around sugar, dried fruits, sweet baking spice and dried citrus peel. Having said that we did taste a couple of blends that showed a high ester content (Appleton Estate 21 years) where notes of plastic and bananas came through alongside the more familiar rum flavours. Esters are a group of congeners or flavour compounds, which are created during the fermentation to produce the alcoholic liquid for distillation. It is usually the interaction between acids and alcohol during this fermentation, that produces these particular flavours. Rum however, has one more trick up its sleeve and producers may choose to use something called dunder to enhance the formation of these flavours. Dunder is the non-alcoholic residue left at the bottom of the still after a distillation has taken place. It is collected and stored outside in pits where bacteria get to work breaking down this residue and concentrating the ester content – as well as creating a rather potent rotting smell. This highly aromatic material may then be added during fermentation to increase the acidity levels of the liquid which will increase the interaction of acids and alcohol. The result is high levels of esters and a more pungent, heavier style of rum is produced. It is very rare to see high ester rums sold individually, they are usually sold or traded for blending to add character to the rum. Another very interesting taste was the rum from Austria – Stroh 80. Legal definitions of what constitutes a rum are far less defined than, for example Scotch whisky, which states where it must be made, for how long it must be aged and so on. With this in mind, I had no expectations for the rum from Austria and what a surprise it turned out to be. Lighter fluid is not a tasting descriptor I have used in the past but I truly expected my mouth to burst into flames after tasting this one! As one might expect, this rum makes a useful addition in the making of a cocktail and I assume that is what the producers had in mind. 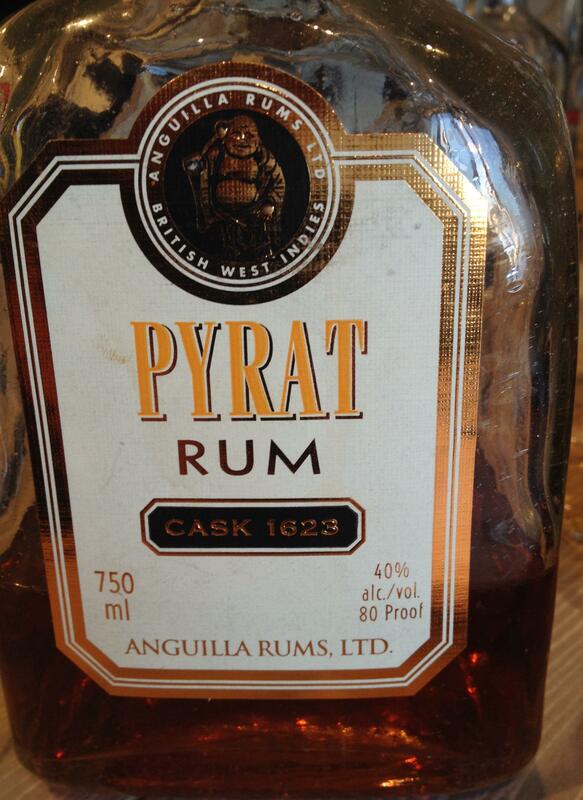 Of all the rums I tasted the Pyrat Cask 1623 was my absolute favourite. Layer upon layer of dried fruit, citrus peel, sweet spice and pungent spice unfolded on the palate. This continued through on the finish with soft liquorice notes at the end. Sadly, at $200 USD a bottle I will not be drinking too much of that! Below are my tasting notes during this session. I’ve included them because thus far in my studies I have found it useful to compare my own tasting notes with those out there on the internet. Of course, it doesn’t beat my own tasting group which is made up of fellow students with great palates and from whom I continue to learn a lot, but I have found the additional resource of the internet to be rather helpful when thinking about common flavour groups. Keep in mind the tasting session with my rum enthusiast friend was very informal and, in keeping with WSET guidelines for tasting spirits, I did add water before actually tasting the spirit. 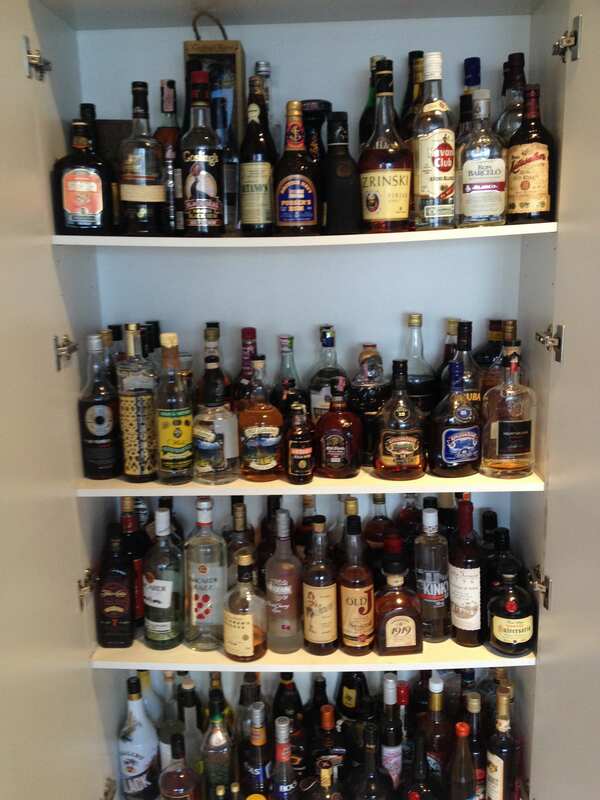 Today marks one month before my exam and if nothing else, I do actually feel prepared to taste and discuss rum – many, many thanks to that friend whose kitchen cupboard I am so grateful to have raided! Sugar cane, vanilla, fennel. Smooth well-integrated alcohol, well balanced simple flavours. Sugar cane, vanilla, liquorice, icing sugar. Soft well-integrated alcohol, smooth texture. Sugar cane, vegetal notes, icing sugar, honey, stone fruit (peaches), cloves, anise, cinnamon, vanilla, spun sugar and burnt toffee. Full body, luscious mouth texture and long finish. Sugar cubes (brown), some spicy grain notes, vanilla, liquorice, cloves, toffee, caramel, butterscotch, dried fruit (raisins, figs), hazelnuts, fruit cake spices. Long finish. Banana cake, dried orange peel, honey, vanilla, dried fruit (raisins, figs), baking spices (nutmeg, cloves), molasses and golden syrup. Lots of dried fruit (orange, lemon, grapefruit, sultanas, figs), orange blossom, nutmeg, vanilla, coriander, liquorice. Smooth, luscious with a very long finish – layers of citrus, sweet spice and more pungent spice unfolding on the palate and continuing through on the finish with soft liquorice notes at the end. Liquorice, cloves, vanilla, caramel, butterscotch, dried fruit (raisins, figs), honey, bread pudding with raisins. Long finish. Nutmeg, toffee, butterscotch, vanilla, icing sugar, dried fruit (raisins, sultanas), anise. Christmas spice (cloves, nutmeg, vanilla, cinnamon), black pepper, coriander, citrus peel (orange, lemon), butterscotch. Long and complex finish. Cloves, rosemary, liquorice root, vanilla, toffee, butterscotch. Long finish with complexity. Vanilla, cloves, cinnamon, nutmeg, toffee, dried fruit (raisins, figs), thyme, rosemary, anise. Long finish with lots of liquorice and spice. Christmas cake baking spices (vanilla, cloves, nutmeg), dried fruit (raisins), herbs (thyme), vegetal or grass notes, caramel and liquorice. Bananas, varnish, caramel, vanilla, nutmeg, Christmas spices, dark cooked raisins, anise. Molasses, brown sugar, treacle, dried fruit (raisins), plastic, bananas, vegetal notes. Vanilla, caramel, fudge, grain. Very warm alcohol but smooth and luscious texture. Charcoal, kerosene, burnt sugar/toffee, honey comb (hokey pokey for those Kiwis out there), candy floss, plastic. A luscious mouth feel due to the high alcohol but very much like lighter fluid. Fruit cake (dried raisins, figs, nutmeg, cloves, vanilla), poached raisins, molasses, citrus peel, liquorice, treacle. Long and complex finish. Treacle, molasses, dark fruit cake (raisin, orange peel, spice; cloves, cinnamon, vanilla, nutmeg), toffee, caramel. Long and complex finish. Wow! What thoroughly investigated information……..well done, you! Best of luck with WSET4 ! !